Nelson is requesting ballots which have already been considered and declared not legally cast instead be counted. This will be heard in court later this week. 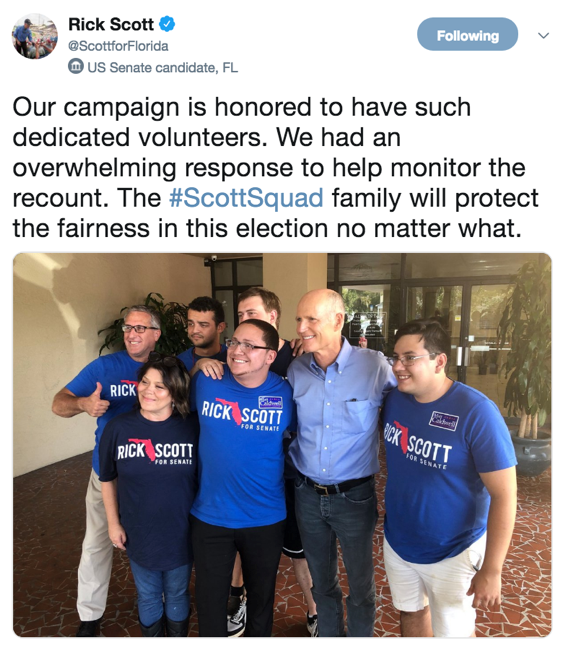 Bill Nelson and his campaign argued that 22 ballots that the Broward County SOE admitted were unlawful should be counted anyway. During the Canvassing Board meeting in Palm Beach County last Friday night, lawyers for both Bill Nelson and Andrew Gillum OBJECTED to Palm Beach officials rejecting a ballot from a non-U.S. citizen. When the Broward County Canvassing Board continued counting ballots more than an hour after Saturday’s noon deadline – a clear violation of state law – the lawyer representing Bill Nelson’s campaign stood up and stated that their campaign is “not objecting” to the illegal activity. Bill Nelson also requested to halt last Saturday’s deadline for county canvassing boards to submit unofficial results of the election to the Florida Department of State. United States District Judge Robert Hinkle effectively denied this request. 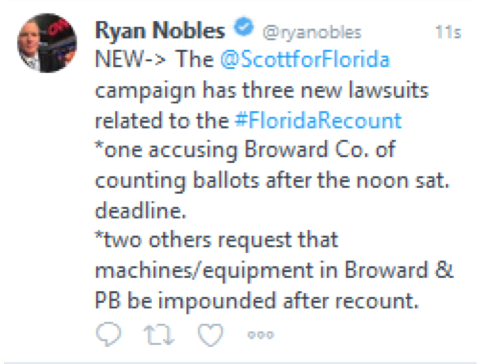 It’s clear that our lead is mathematically impossible to close without fraud…so Nelson and his DC lawyers are doing their best to count fraudulent ballots, laws be damned. As the recount process continues, so do the issues out of Broward and Palm Beach Counties. Get an update on the Scott for Florida’s recent legal filings regarding yesterday’s concerns HERE. On a related note, for a deeper dive on the misinformation being spread by Bill Nelson and his DC lawyers regarding undervotes, click HERE. Senator and NRSC Chair Cory Gardner weighed in on the Supervisors of Elections’ blatant disregard for Florida’s elections laws on Sunday’s Meet the Press. …and echoed what Bill Nelsons’ and his liberal lawyers can’t seem to grasp – Rick Scott won. And we close with this daily reminder: Senator-elect Rick Scott won the race by 12,562 votes. This margin is 5 times the largest shift during a recount in American political history. And Bill Nelson can decline the recount at any time.